Not confined to just our hedgerows, the hardy snail can also be found in our lakes, rivers, and seas. Snails and mussels are the only molluscs to be found in both freshwater and saltwater habitats. Though all related, there are plenty of differences among these various species that they have evolved to give themselves the best possible chance of survival and procreation. Arguably the most adaptable of the snails, freshwater snails are much richer in variety of species than their marine cousins. 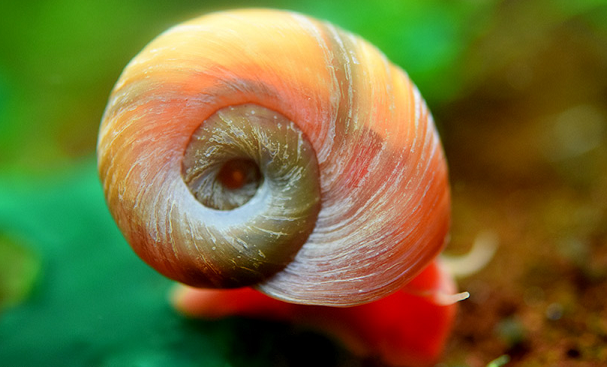 In a seawater environment the conditions are relatively stable, but for the freshwater variety, conditions like temperature and currents can change rapidly, requiring the snail to be more versatile in its ability to survive. The snails found in a river or lake can be categorized into two groups; those breathing with gills like mud snails or freshwater nerites, and those that have lungs like the pond snails, bladder snails, or freshwater limpets. The common river nerite, an endangered species due to man’s environmental impact, has adapted to live where fresh and salt waters mix at river mouths. Unlike any of its marine or land relatives, it has a very thin shell. The nerite lives on silicate algae and lays eggs on the ground as well as in other molluscs’ shells. Mud snails are herbivores, and use their gills not only to get oxygen but to filter nutrients from their breathing water, just like a mussel would. They will rest in high-nutrient areas to maximize the benefits. Young acute mud snails hunt for food by hanging upside down from the water’s surface, as do pond snails. They also have separate sexes that can be easily recognized, the female being much larger with more bulbous shells. The mud snail is also unique in that its young are born live, rather than hatched from eggs: they develop as embryos inside the female’s body. Though greatly outnumbered in variety by their land and freshwater relatives, there is still amazing diversity to be found among marine snail species. 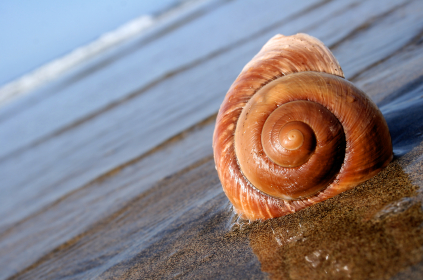 All sea snails breathe with gills and are adapted for living in their chosen environment. The diet varies from filtered algae, to carrion, and there are a large variety of predatory snails. In the case of the cone snail, its prey is shot with a venomous harpoon and paralyzed before consumption. They also hold the dubious honour of being the only snails that are dangerous to humans. The common whelk and other sea snails have evolved a survival defence different from land snails – they can shut the door. Most sea snails have a lid attached to the snail’s foot that shuts off the shell when they withdraw, an advantage for land snails to be jealous of. The unusual shell of the common limpet might not lead one to believe it was a snail at all, and it differs greatly from its cousins. The limpet clings to rocks and feeds by scraping off the algae, and the slime trail they leave reminds them not to visit the same spot twice. Their domed shell is not only used as defence against predators like their whelk relatives, but can also be used to bulldoze competitors for food, the mussels and barnacles, away from their feeding spot.